Last Mother’s Day, my husband and daughter gifted me with a Cath Kidston book. To say that I am fan of hers is an understatement. I love flowers, pastel, and all things pretty. Cath Kidston’s flower print designs fit me to a T. I was thrilled when I opened my gift as I didn’t know that she had a book. I later learned that there are only few copies around now as the book was released way back in 2005. Luckily my husband and daughter were able to snag one of the two stocks left at National Bookstore ATC. As a child, Cath Kidson already had intense fascination for prints. Her compulsion to buy vintage prints started when she was a teenager. She would hunt flea markets and country town fairs for them. But then it was only when she became an interior designer that she seriously started to build her vintage prints collection. She has always been drawn to old floral prints since they exude a certain kind of freshness. She had these vintage prints documented and had reworked them into contemporary floral prints in new, fresh designs. She started her business selling pretty ironboard covers, it was well received and her prints became a hit so soon after, she started selling a wide range of products such as dog beds, towels, hair ties, and handbags as well. To date, she has several flagship stores in the world, three of which are in Asia, one in Japan and 2 in Thailand. 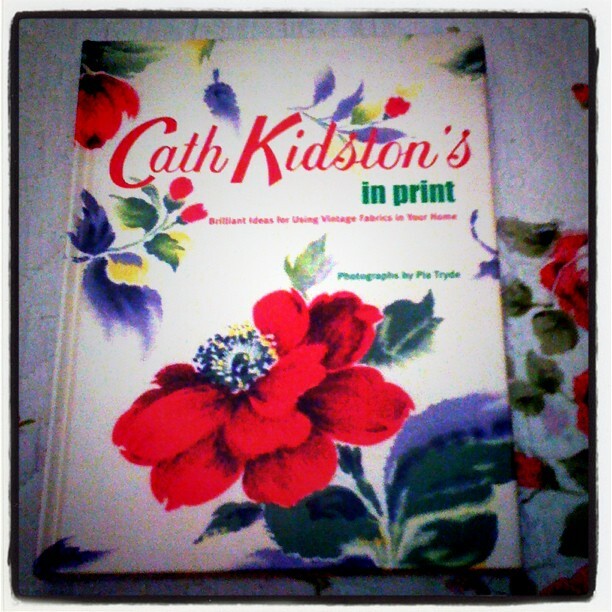 The book, Cath Kidston’s In Print has page spreads full of pictures of her trademark prints. It features some of her DIY projects such as pillowcases, upholstered sofa, lampshades, kneelers etc. It is sort like a tutorial book for moms and ladies who are fond of sewing and DIY projects. The sewing instructions she provided in the book are simple and easy to follow. There are also lots of suggestion on how to perfectly combine colors and prints to give for example a sofa or lampshade a fresh new look. I love all things pretty and nice that is why I am a sucker for Cath Kidston stuffs. I like how her floral prints add a touch of gentleness and girliness to things. Seeing her prints makes me happy. One of these days I will start redoing some portions of our house or follow some of the DIY projects in the book to make it cosy, pretty, and nice too just like these Cath Kidston inspired rooms. I want that when friends come to visit our house, they will leave with a smile on their faces and bring home with them a warm happy glow, much like what happens to me when I see Cath Kidston prints around. I love the designs. Yay, so cute ng flowers at pink and red mostly! Your husband and daughter love you so much… They knew what gift will surely make you happy! Happy Mother’s day! Love those designs! Captured scrapbook type that made you inspire to take care of the book and thus reading it all over and over again…Thanks for sharing! Wow,,, very nice!!!! I like your design. The colors that you choice is good. Nice to see your blog, Good info. Keep posting new stuff. Will be visiting this site frequently.